Heat olive oil in a large pan over medium heat. Add shallots, mushrooms and Italian seasoning. Cook, tossing until softened and browned about 10 minutes. Season with salt and pepper. Place flatbreads on a parchment-lined baking sheet. Spread 1 to 2 tablespoons of artichoke pesto over flatbread. Sprinkle cheese over mushrooms or if you like, reverse the order and sprinkle on the cheese before spreading on the mushrooms. Bake flatbreads until cheese is melted and crust is golden brown, about 7 minutes. While pizza is in the oven, place arugula in a large bowl, drizzle with olive oil and lemon juice. Season to taste with salt and pepper. Remove flatbreads into slices. 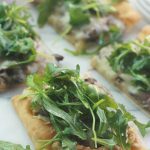 Serve with salad on the side or on top of flatbread.